It’s a two-for-one FFwD weeknight special! The two last French Fridays with Dorie recipes highlight the cornerstone of weeknight cooking at our home – the dinner salad. This week’s selection, Olive-Olive Cornish Hens, couldn’t have been simpler. The hardest part, in fact, was finding the cornish hens. Admittedly, I left it for the last minute, and they were out of at the supermarket. Bone-in chicken thighs were a perfectly adequate substitute. The dark meat remains moist, while the skin crisps after a few minutes in the broiler. I had an olive tapenade recipe from my work friend Lorena I had been meaning to try for a while now. She usually brings a huge bowl of black olive tapenade to the unofficial work holiday party and I always find myself parked by the bowl. She graciously shared the recipe with a few of us: a six ounce can of pitted black olives, one large clove of garlic, rosemary, black pepper and olive oil. I whipped up a batch – it yielded more than enough to lodge between the thigh skin and meat and to enjoy with multigrain pita triangles. 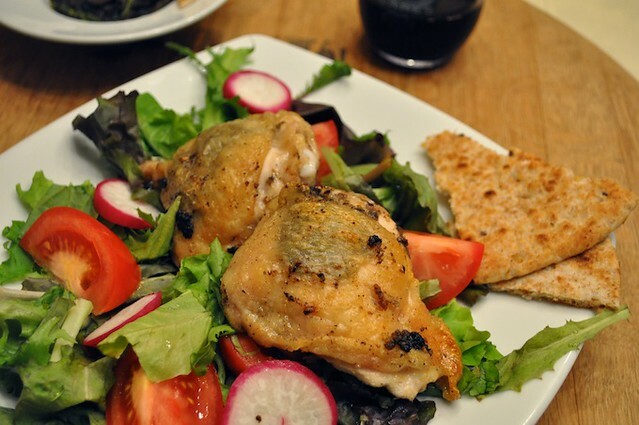 I really enjoyed this, mostly because it was so easy to pull off and because of the great contrast between juicy chicken, briny tapenade, and fresh salad. Last week’s Deconstructed BLT and Eggs took approximately the same amount of time to make as the chicken thighs salad. What I really liked about this salad was trying to come up with the perfect bite. Lettuce, bread, sundried tomato? Egg, tomato, mayo? Bacon, tomato, mayo? Instead of the straightforward everyday vinaigrette suggested by Dorie, I just doused it with a couple of teaspoons of olive oil and champagne vinegar. 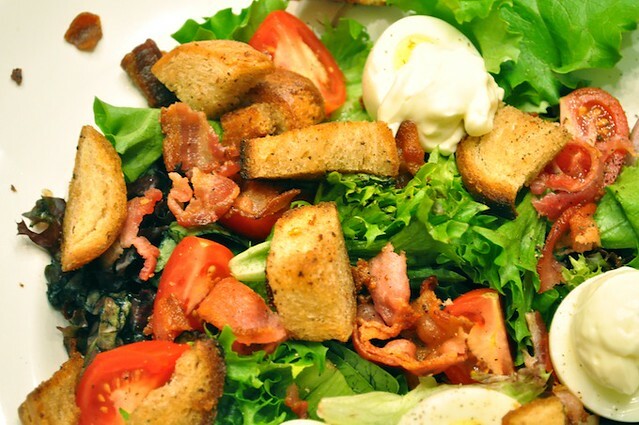 The vinegar cut through the fatty croutons/bacon/eggs/mayo perfectly – as would have a glass of bubbly on the side. 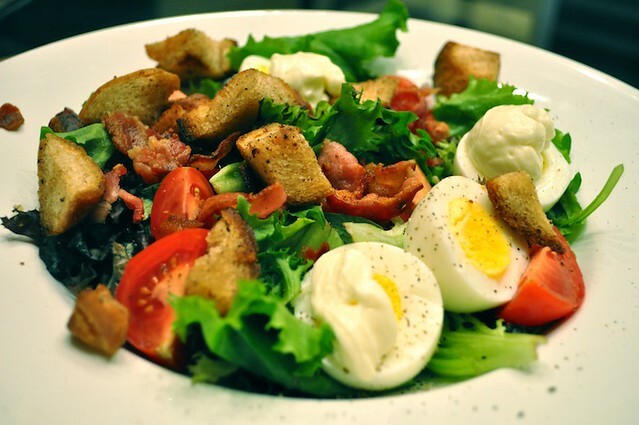 For more wonderful dinner salads, French Fridays with Dorie style, check out the Bacon, Egg, and Asparagus Salad and the Quinoa, Fruit, and Nut Salad. Adriana is a financial analyst by day, avid home cook in the evenings, and food blogger and runner in the strange hours between those two. When not in the kitchen concocting meals and stories to pass around, she is out looking for the next great bite (or the ingredients to make it at home), checking what's new at the market, or planning a trip around great food and wine. Spicy Eggplant Pasta Bake… and a bit of Housekeeping! That skin…I just want to tear it off and I think I will make this salad. Hope all is well…the Mofongo post is up. I am still not receiving your posts by e-mail. What is is it about puertorriqueños and cuerito? With all fats, for what it is worth. I guess I forgot to mention that some of the chicken pan, er, juices partially dressed the salad. 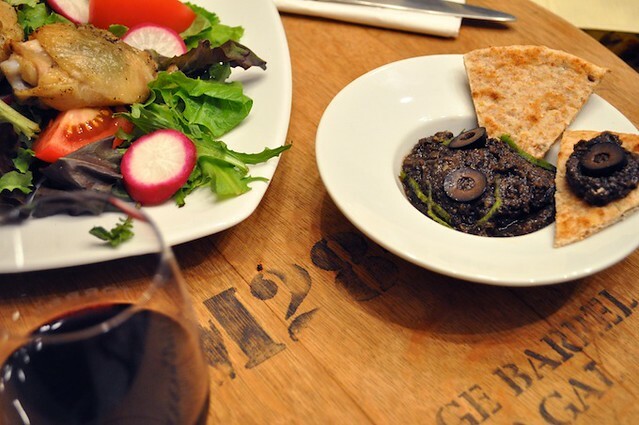 Great looking salads and your tapenade looks tasty as well. I fear that I may have been the only lazy one to use store bought tapenade this week. Oh well, maybe next time. I’m sure you have access to some fabulous tapenades! Both dishes look so beautiful! And ditto Cher on the tapenade – brilliant, serving some on the side! I bet the tapenade was so tasty with the chicken thighs. Great pairing with the BLT salad! They were actually two separate meals. I made the deconstructed BLT salad last week on Thursday night, but was completely drained from work to sit in front of the computer for a minute longer than I had to. There’s quite a backlog of unprocessed pictures/recipes waiting to get some blogging love. I’m so happy to know this worked well with chicken thighs. That’s usually what I prefer when having chicken. The hens were cute, but I was already thinking that next time I would try with thighs. Thanks for leading the way, Adriana! I have pita chips at home, so I think I’ll be having leftover tapenade for an appetizer as I make tonight’s dinner. P.S. I like your new blog format. Great look! Thanks Betsy! The chicken thighs were really good. Funny thing – I picked them thinking they would be the closest thing to the Cornish game hens (short of spatchcocking a whole chicken), yet I find out this morning that they are an all white-meat bird! Love the two salads. Yum!! What a yummy looking two-fer post! I enjoyed taking different combinations of bites with the BLT salad too. Both your salads look wonderful! I can imagine the tapenade would be good with chicken thighs. Looks delicious! Love the bone-in-thigh substitution! but we enjoyed this week’s cornish hen. Very simple and quick, great for working Moms. Your photos are stunning, Adriana! We didn’t use Cornish hens, either…a whole chicken worked well. I want to try that salad…I didn’t make it but most FFWDers seem to have like it a lot. Everything looks wonderful! Colorful healthy salad, and chicken is cooked perfectly! Hate when you can’t find what you need at the store though! Today 2 stores were out of powdered sugar! Slurp slurp just looking at yours reminds me that I have to make this again next weekend for pot bless…it was good and I love the olive tapenade in the chicken…tasty and flavorful. Beautiful clicks ! Have a nice day. I love the idea of making the chicken – or game hens, or whatever – as a dinner salad. I wonder if there’s anything that can’t be turned into a salad? Maybe beef stew wouldn’t be so great, but most dishes look even better, and healthier, when they’re nested on greens. Bone-in chicken is definitely not traditional for salads, but being a big fan of bacon fat dressed salads, I figured I could serve everything together. As for the BLT croutons, I liked them because the bread I used was very stale. I guess the trick for frying up croutons with bacon fat is to make sure that you don’t have too much burned bits in the bottom of the pan. Love the photos! 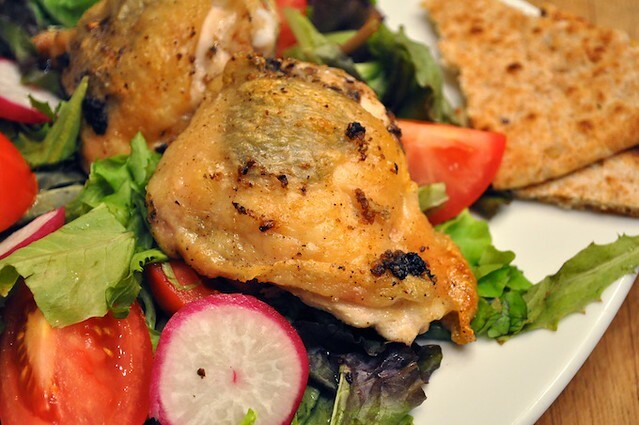 Chicken thighs were a great substitution and serving them over salad sounds lovely. I agree with you about the BLT & Eggs Salad – it was impossible to decide which was the best bite! Like what you see? Pin it! Scroll through our Instagram latest! All images and content on GreatFood360.com are copyright protected. These works cannot be republished or used without prior permission. Licensing inquiries for commercial use, publication and general distribution can be sent to adriana (at) greatfood360 (dot) com. Great Food 360˚ Copyright © 2019. All Rights Reserved.